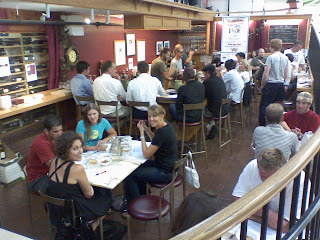 We're at Hi-Times Wine Cellar for a beer tasting. The theme is "End The Summer Light". The focus seems to be off-beat wheat. Wits, hefes, saisons, and more are on the 13 beer tasting session menu. Sent from my mobile phone.